Double Fine Games invite you to get in a time machine and revisit a classic title from years gone by. 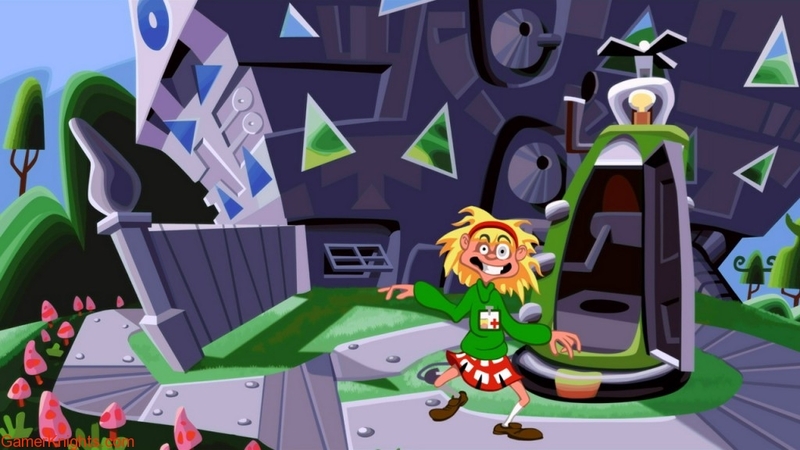 Day of the Tentacle was one of my favourite point-and-click games growing up, far outshining – in my opinion – the Monkey Island games that came before. I’d loved Threepwood, but Tentacle’s weird story, weirder characters and hilarious events and puzzles played perfectly to a strange little kid like me. 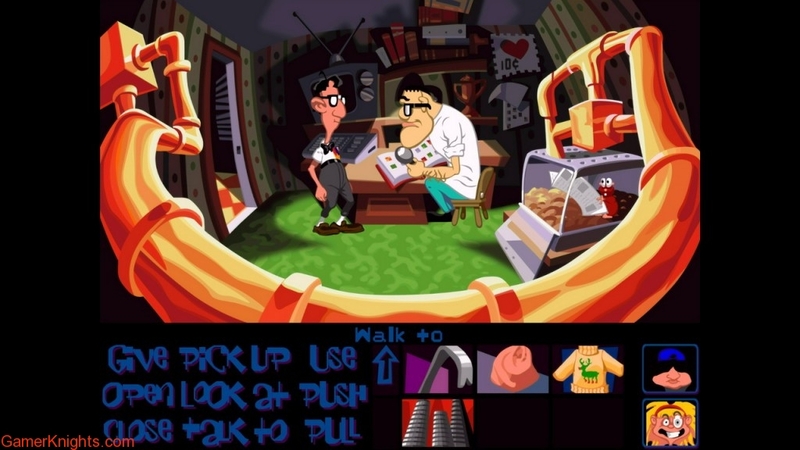 Day of the Tentacle is a really out-there adventure game that serves as a follow up to Maniac Mansion (which itself is fully playable within DOTT). Our protagonists, Bernard, Hoagie and Laverne, have a time-based mishap whilst exploring a mansion and get scattered throughout the past, present and future, and must help each other (with some really smart, time-hopping puzzles) to fix everything. As a chronological stepping stone between the Monkey Island games and the fantastic Grim Fandango, you can see Shafer and Co. finding their footing and perfecting their oddball art. Day of the Tentacle is a mix of old Saturday morning cartoons and an uncomfortable acid trip. It doesn’t always work – or at least revisiting it over two decades later and twenty-something years older hasn’t helped in digesting its zany quirks – but when it’s on point, Day of the Tentacle really shines. 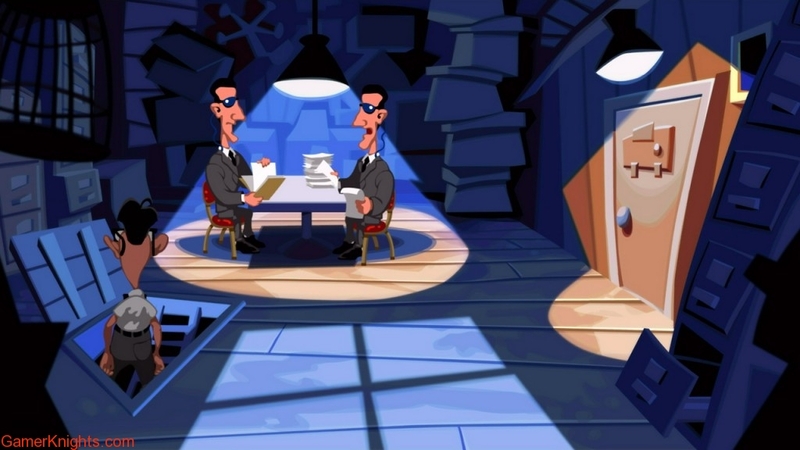 I’d forgotten just how bloody weird Day of the Tentacle is. Back in ’93 it was okay to be weird, gaming was weird, gamers were weird, but now? Now everything is slightly more homogenised, and it makes Day of the Tentacles bizarre narrative stick out like a wonderful sore thumb. I say, let’s get back to being weird. 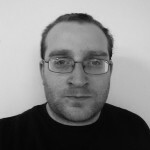 As a self-respecting point and click, Day of the Tentacle is entirely focused on puzzles, item combining, dialogue trees and moving the plot along by way of some farfetched deductive reasoning. Now, the puzzles here are actually more grounded than most Lucasart / Double Fine titles, and as such are more rewarding to wrap your head around. The ones that span timelines are some of my favourite, and are really unique puzzles in what was once such an oversaturated genre. I did have to refer to a guide a couple of times to remind me of an especially obtuse challenge, or simply to speed the game up when it began to drag its heels (which it occasionally does), but for the most part Day of the Tentacle keeps up its momentum throughout. The update also brings about a more modernized interface, with smarter controls and ways to interact with the world. It’s an altogether more intuitive way to play, and one I was thankful of when I remembered how clunky these old adventure games could be. It’s in Tentacle’s presentation that fans of the original will see the biggest changes, obviously. Should you need reminding just how different things used to look, the game helpfully includes a button to instantly shift back to its original aesthetics. It’s a startling change, and one I enjoyed toggling between throughout my adventure. Another awesome addition – and one I applauded in the remaster of Grim Fandango last year – is the inclusion of developer’s commentary. I really enjoyed going back through the adventure with the anecdotes and jokes of the team to accompany me, and I urge you all to do the same once you’ve blasted through it the first time. Day of the Tentacle is a smart update to an aging classic. It plays like a more modern adventure game and looks like one too, and neither of these changes diminish from Tentacle’s wholly unique charm. It’s a zany game that many may find too weird now, but for older fans – or newcomers willing to give this trip a try – you’ll find a game that’s still as smart and funny as ever.